Subterranean termites annually cause many, many millions of dollars in damage to homes and other wooden structures in the United States and around the world. Over time, a termite colony can literally reduce a home to sawdust. 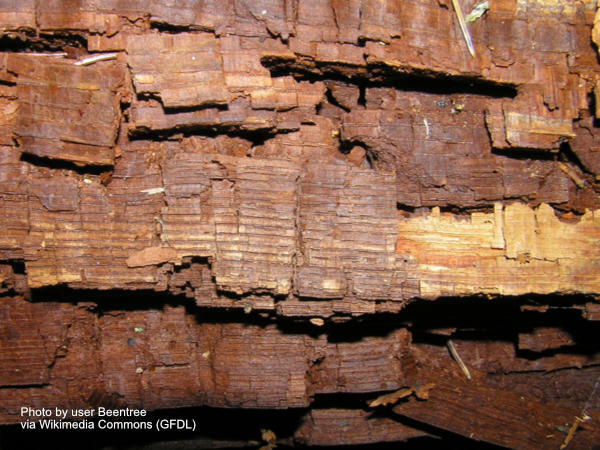 Termite damage is characterized by galleries inside or on the service of the wood, often accompanied by shelter tubing on the outside or mud inside the galleries. When the termites are feeding on the surface of the wood, the area they're feeding on will be covered by a patch of mud that is an extension of the shelter tube leading between the soil and that piece of wood. When they're feeding on the inside of the wood, there may be little visible sign that the wood is infested at all. The galleries themselves will be rather rough compared to carpenter ant galleries, which are very smooth and appear almost sand papered. 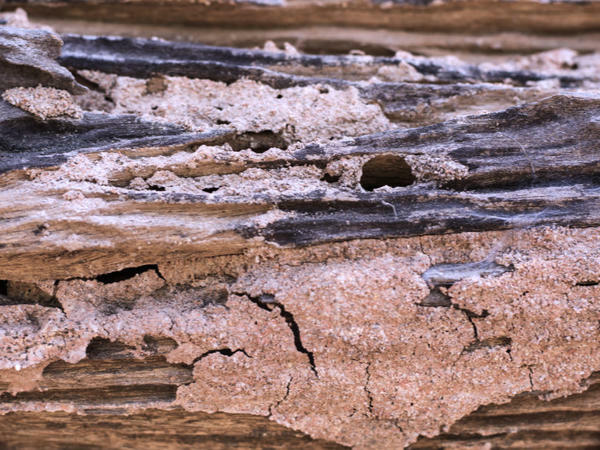 Termite galleries also tend to follow the grain of the wood, unlike damage from powder post beetles, whose feeding ignores the grain structure. Termites often enter a piece of wood from hidden areas such as wall voids, in the gaps between a house's framing and the exterior brick veneer, from between the sill plate and a beam or joist, or from the insides of ornamental columns or posts. Consequently, homeowners don't always realize that they have a termite problem until thousands of dollars worth of damage has occurred. The termites' secretive habits and tiny size can prevent them from being noticed by untrained people until extensive damage has already been done. Left untreated, termites can cause severe damage which, over time, can undermine a home's structural integrity and threaten the safety of those who occupy it. In extreme cases, termite damage has caused some buildings to collapse. If you have reason to believe you may have a termite problem, you should call a professional to have your home inspected. Expect to pay a nominal fee for this service, usually in the $75.00 to $150.00 range in most of the United States. Most pest control companies also sell renewable warranties that will pay for a termite treatment (and sometimes damage repair) if an infestation ever does occur. It's something worth considering if you live in a termite-prone part of the country. Not all wood damage is caused by termites. Skilled exterminators must know how to distinguish termite damage from other types of damage, such as the following. The wood in the picture shown here is damaged by cubical wood rot, one kind of dry rot. The wood basically flakes off in chunks that often look "dirty,", as if they'd been buried for a while. 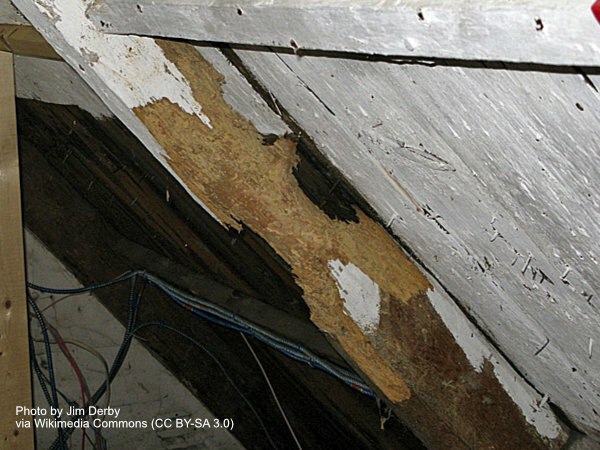 Other kinds of wood rot and damage are caused by water. Water damage from an uncorrected water problem is usually obvious because the wood will be wet or damp. Damage from a corrected water problem will also usually be obvious because the wood will have water stains. In either case, the wood may appear soft, soggy, or rotten; may contain traces of mold; or may have a foul or musty odor. The fact that a piece of wood is rotted or water-damaged doesn't mean that it doesn't also have termites. In fact, water damage in particular actually increases the likelihood that the damaged timber will be infested by carpenter ants or by another type of termite called dampwood termites. Rotted or water-damaged wood may also affect the structural integrity of your home and require repairs or replacement, even if no wood-destroying insects are present. In other words, just because a rotten or water-damaged piece of wood doesn't have any sign of termite activity doesn't mean that you don't have a problem that needs professional attention. It just means that you may need to call a carpenter rather than an exterminator to help you with it. Any damage to a home's structural wood needs to be evaluated by a professional. The wood in this picture has damaged by carpenter ants, not termites. Of all the wood-destroying insects, the damage done by carpenter ants comes closest in appearance to that done by termites. To the untrained eye, they may look nearly identical. But there are some differences. One difference is that carpenter ant galleries are smooth and clean. They look almost as if they had been sand papered. 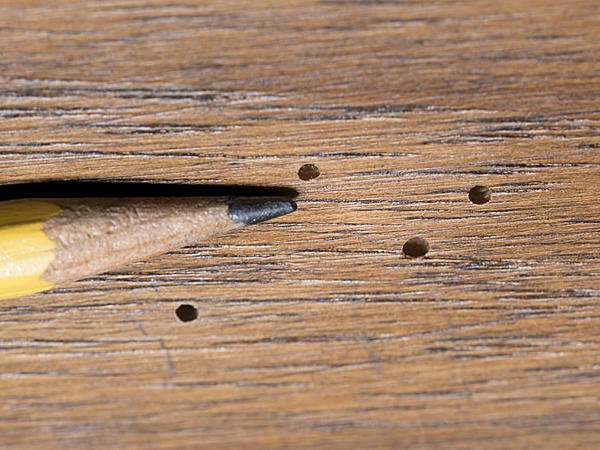 The reason why carpenter ant galleries are so smooth is that carpenter ants lay their eggs in wood, so they want it to be smooth and free of debris so it doesn't injure the eggs and the larval ants once they hatch. So they sand it down and eject the sawdust. That's why you'll often find sawdust, which exterminators call frass, under and around a piece of wood that carpenter ants are infesting. Termites, on the other hand, eat the wood, so they don't care how untidy the galleries are. There's also no sawdust because the termites eat it. Their galleries are roughly-chewed, not sand papered, and often contain mud and debris. In fact, the presence of mud inside a gallery practically guarantees that a piece of wood either is or once was infested by termites. Carpenter ants can cause significant damage in their own right, so the fact that a timber has been infested by carpenter ants rather than termites doesn't mean that you don't have a problem. It also doesn't mean that the damage to that timber isn't undermining the structural integrity of your home. Whether your problem is carpenter ants or termites, you need to have it looked at by a qualified pest control operator; and wood damage of any kind needs to be evaluated by a qualified carpenter, engineer, or home inspector. This damage is due to powderpost beetles. But it's not typical of what most powderpost beetle damage will look like from the outside. This picture is more representative of what most powderpost beetle infestations will look like to the homeowner. Powderpost beetle damage is easy to miss because the beetles do almost all their damage inside the infested timber. They literally eat it from the inside out. All that's visible on the outside of the timber are the tiny holes they bored to get inside the wood. That's why they're called powderpost beetles. From the outside, the wood looks fine; but on the inside, it's been reduced to powder. In most cases, there also will be visible sawdust in and under wood infested by powderpost beetles. That's because unlike termites, the lyctid and bostrichid powderpost beetles that are common in most of the Unites States can't digest cellulose. On the other hand, Anobiid powderpost beetles, which are more common in the coastal areas of United States, can digest cellulose; so there's typically little or no sawdust present under or around the affected timbers because the beetles ate it. Another difference between powderpost beetle damage and termite or carpenter ant damage is that both termites and carpenter ants tend to excavate along the grain, but powderpost beetles ignore the grain. They start at the surface of the wood, drill a hole, and eat their way in, so there are no galleries as there are with termite or carpenter ant damage. 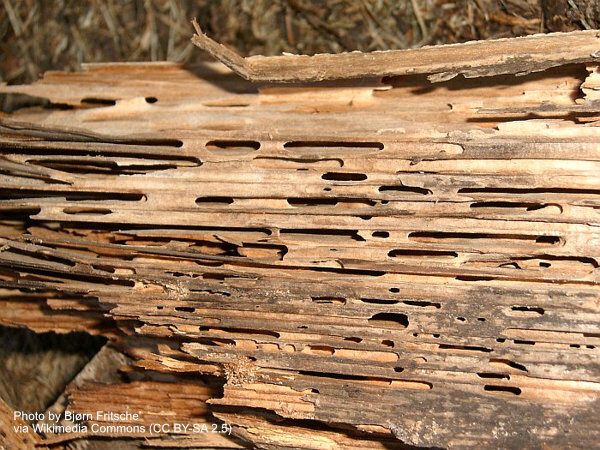 Powderpost beetle infestations may look minor from the outside because all that's typically visible are the tiny holes. But inside the timber, the beetles are devouring the wood and reducing it to powder, making powderpost beetles one of the most dangerous wood-destroying pests. Known or suspected powderpost beetle problems should always be evaluated by both a pest control professional and a structural engineer.